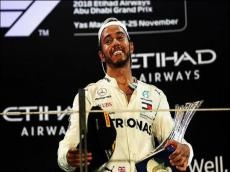 Lewis Hamilton missed out on a second BBC Sports Personality of the Year Award on Sunday night after placing second behind Tour de France winner Geraint Thomas in the 2018 vote. Hamilton clinched his fifth Formula 1 world championship this year, leading to him being nominated for the prestigious award that honours outstanding British sporting figures through the preceding 12 months. Hamilton was one of six nominees for the award, but was left to settle for second place after Thomas won a public vote on Sunday night. It is the third time Hamilton has been the runner-up for SPOTY, following near-misses in 2007 and 2008, with his only victory coming in 2014. On a night that saw England's football and netball teams receive notable recognition, Hamilton was one of two motorsport figures to take home some silverware as Formula 3 racer Billy Monger received the Helen Rollason Award following his comeback to racing from life-changing injuries. 2017 SPOTY runner-up Jonathan Rea missed out on a nomination despite taking his fourth World Superbike Championship this year, with Harry Kane (football), Lizzy Yarnold (skeleton), James Anderson (cricket) and Dina Asher-Smith (athletics) joining Hamilton and Thomas as nominees.